Pride Comes Before A Massive Fall! 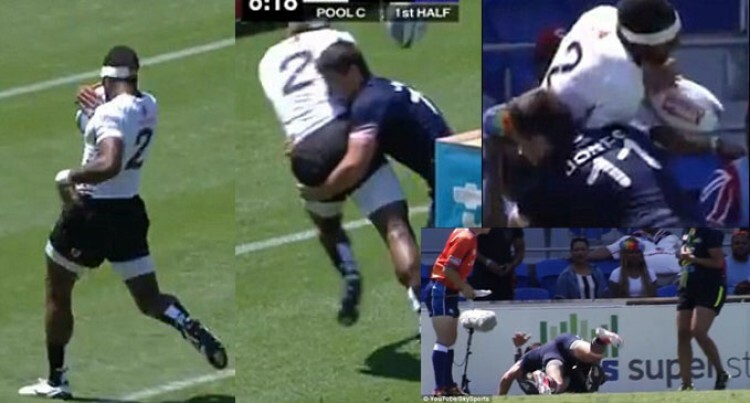 They say pride comes before a fall, but rarely do the falls come as big as the one which saw Fiji sevens player Semi Kunatani thrown to the ground by Scotland’s Lee Jones on Saturday. Fiji were taking on Calum MacRae’s side in a Pool C clash at the Gold Coast Sevens in Australia when Kunatani burst through the Scottish defence for what looked like a certain try. But such was Kunatani’s confidence that he stopped sprinting and sauntered past the try-line before stopping inside the in-goal area. Jones sensed what was happening and raced back to take out the Fijian with a brutally executed tackle. The ball went flying out of the lock’s hands and away to safety, much to his embarrassment and Jones’s delight. Unfortunately for the Scots, the bit of schadenfreude was as good as it got for them as Fiji cruised to a 40-7 victory. Kunatani finished the match try-less and he will surely never hesitate again before grounding the ball once clear. The win helped Fiji top Pool C and consigned Scotland to a third-placed finish which sees them exit the main tournament and go into the bowl competition.